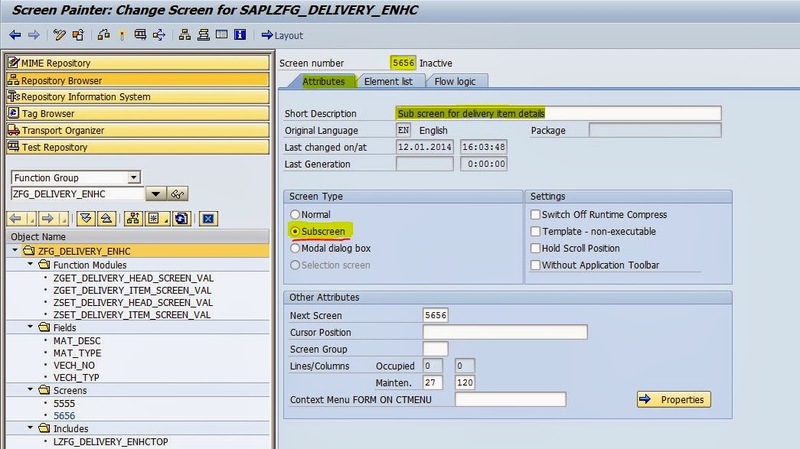 Scenario: Adding a sub screen to the Tcode – VL01N/VL0N/VL03N delivery line item.The task is to find out the appropriate BADI for it and then implementing it. 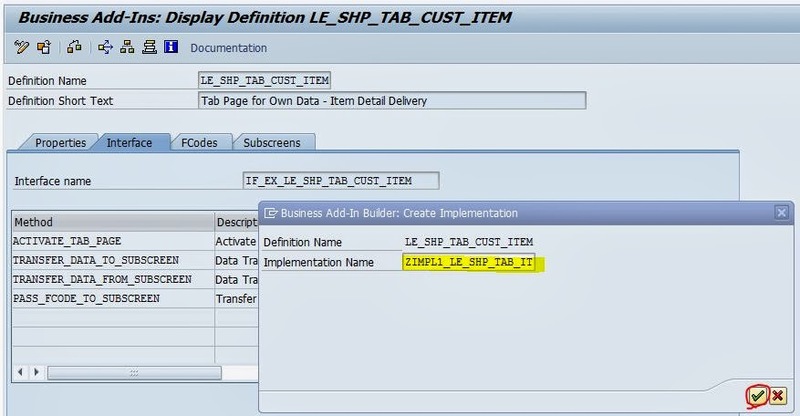 For enahcing the Delivery Line Item Standard BAdI : ‘LE_SHP_TAB_CUST_ITEM ‘ is provided by standard SAP. Step1. Go to Transaction SE11. Step2. Provide the Delivery line item table name as: LIPS and clcik on Display button. Step3. Click on Append structure to create some more fields. Step4. Clcik on the Create Button. Step5. 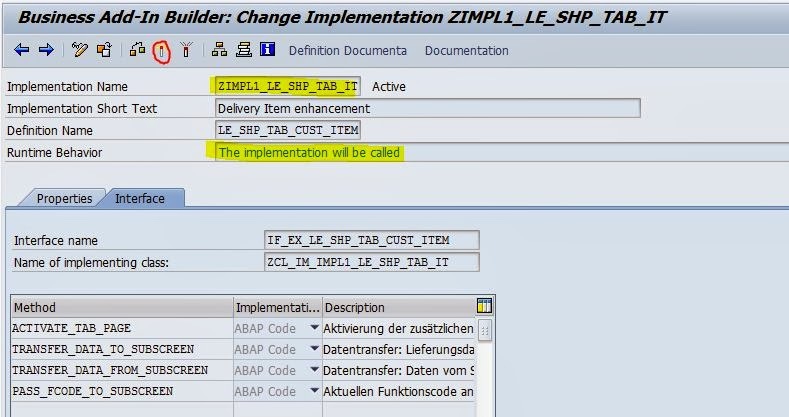 Provide the append structure name and clcik on Continue button. Step6. Cretaed the below mentioned two fileds and clcik on activate buton. Step7. The append structure is activated. Step8. 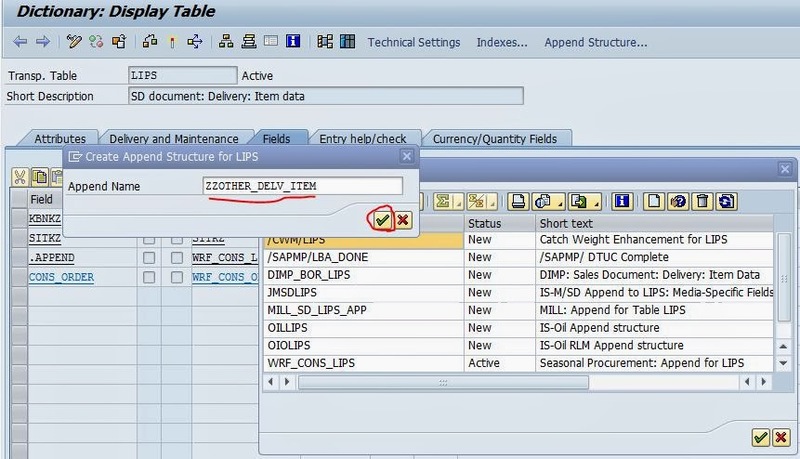 The table is also enhanced with append structure. Step9. Go to VL01N transaction. Step10. Clcik on the highlighted button. Step11. 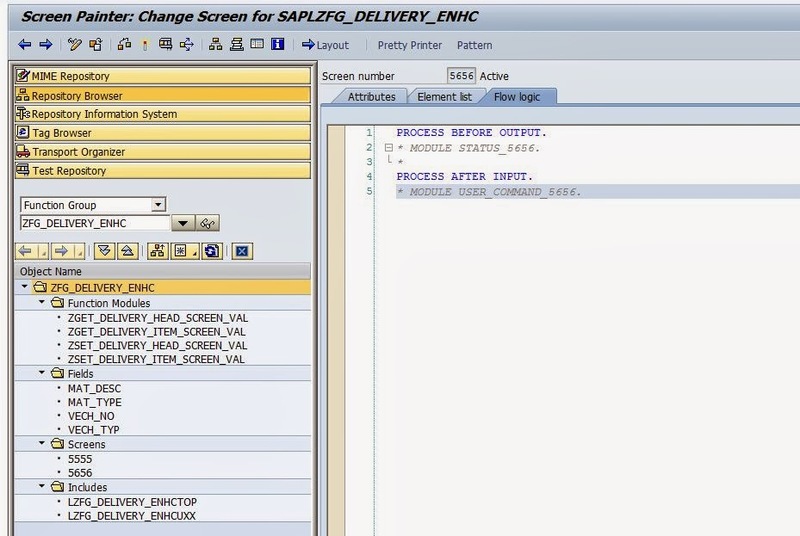 Provide the details and hit enetr button from keyboard. Step12. 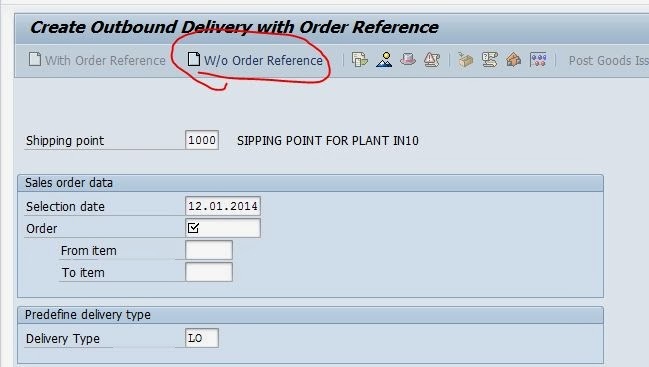 Provide the ship-to-part, teh Planned GI date and material number and quantity. After that double clcik on the line item. Step13. All the tabs are displayed in teh line item for teh delivery order. Our enhancement will add up a new tab to this section. Step14. Now go to transaction SE80 . Step15. 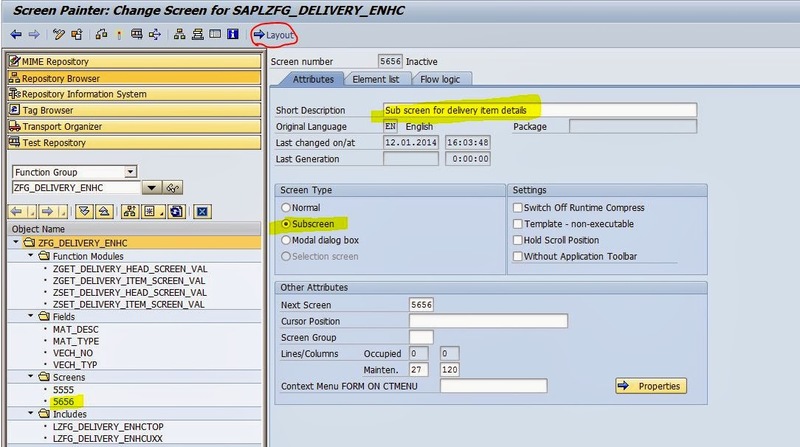 Create a new function group or ypu can procedd with the same function group cretaed for the Delivery header enhancement. Step16. In teh top include of the FG, provide some data objects that will display on the screen. Step17. 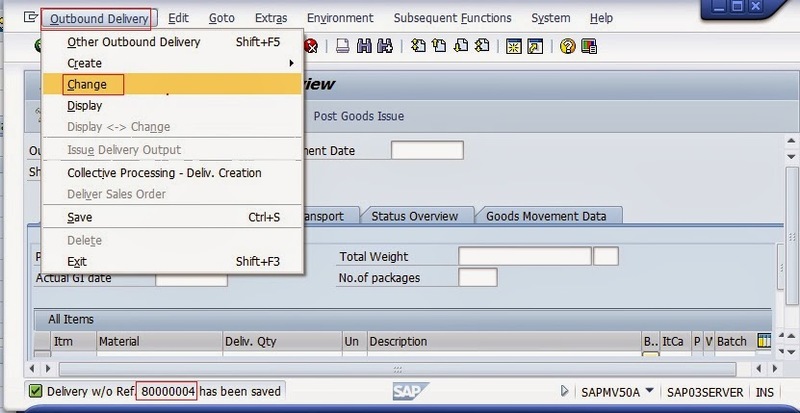 Create a Function Module ‘ZGET_DELIVERY_ITEM_SCREEN_VAL’ and provide the export parameter. Then clcik on the source code tab. Step18. Provide the below code and activate the Function module. Step19. 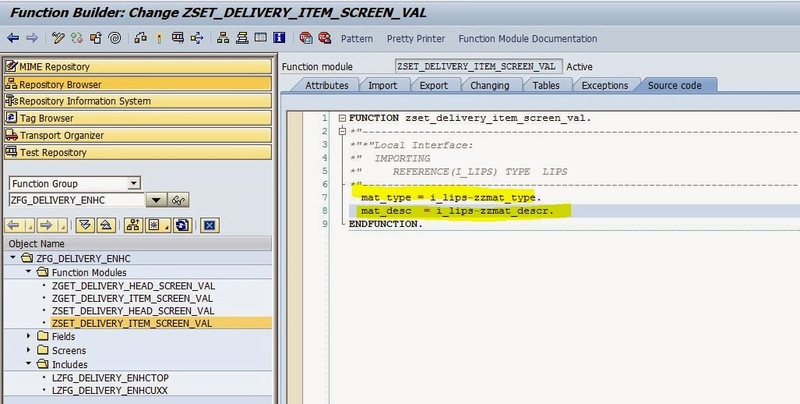 Create another Function Module ‘ZSET_DELIVERY_ITEM_SCREEN_VAL’ and provide the IMport parameter. Then clcik on the source code tab. Step20. Provide the below code and activate the Function module. Step21. 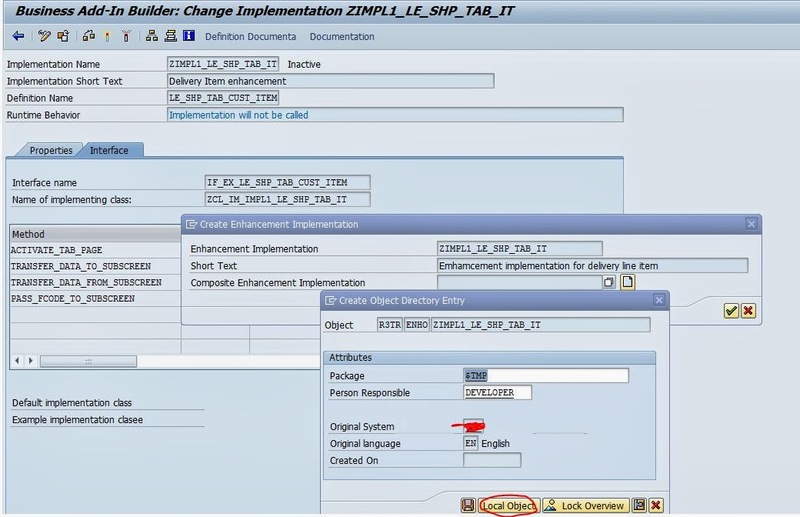 Create a screen ‘5656’ under teh function group and select as sub screen. Step22. Clcik on the layout button to design it. Step23. 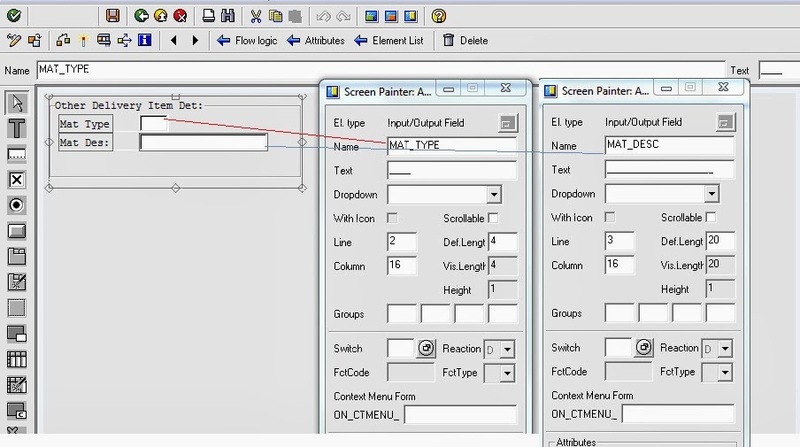 Cretae two text fields and two input fields whose name are same as declared in the top include. Activate it. Step24. No need two put any module in the PBO and PAI of the screen. Step25. Go to transaction : SE18 . Step26. Provide the BAdI Name and clcik on display button. Step27. Navigate along the highlighted path to cretae a BAdI implementation. Step28. 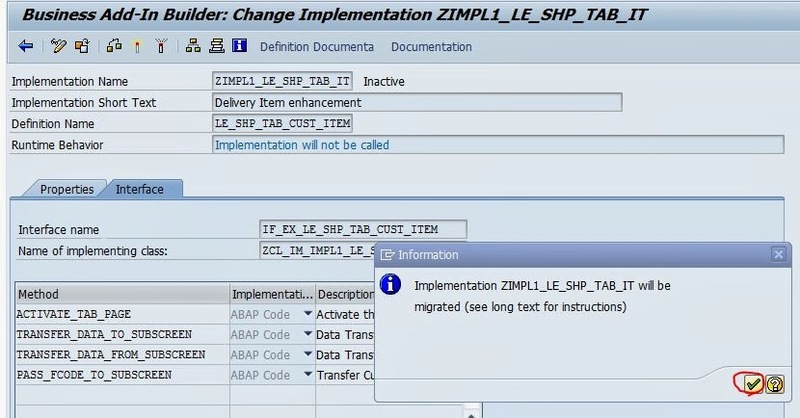 Provide a implementation name and clcik on continue button. Step29. Provdie the short text and clcik on the Interface tab. Double clcik on the highlighted method to implement it. Step30. Clcik on Yes button to continue. Step31. Clcik on yes button. Step32. 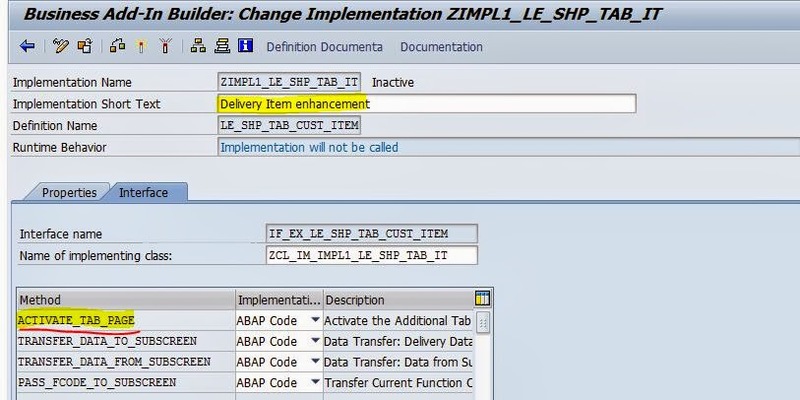 Provide the enhancement implementation name and short description and clcik on Continue button. Step33. Save in Local object. Step34. Provid ethe below code. 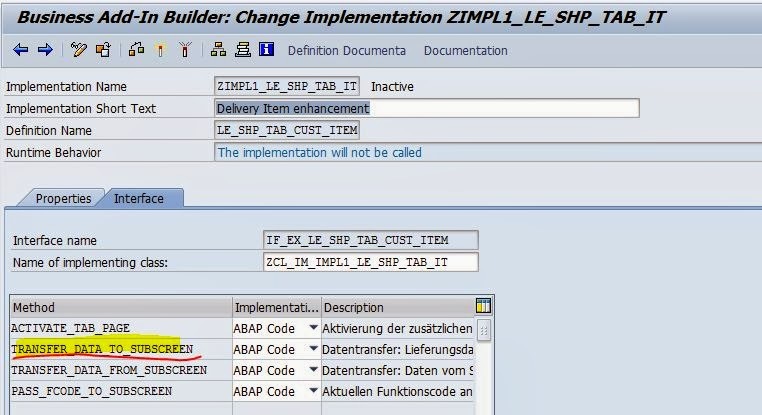 like the Program name should be the function group name prefixed by SAPL and teh screen number . Activate it and go back. Step35. 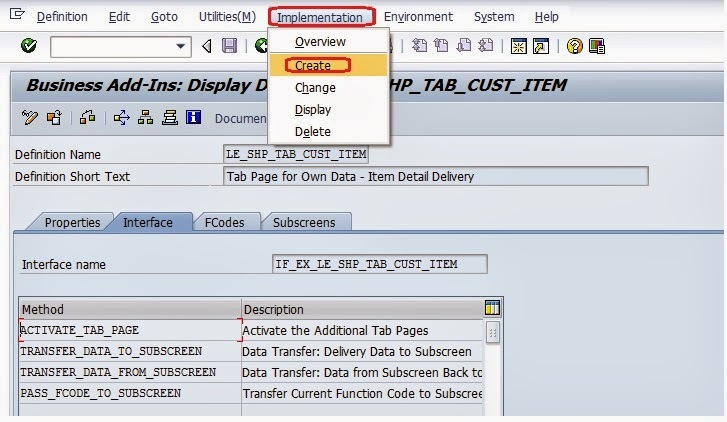 Implement the second method ‘TRANSFER_DATA_TO_SUBSCREEN’ by double clicking on it. Step36. Provide the below code: call the appropriate function module cretaed above for the same purpose. Double clcik on the function module name to see the details. Step37. Clcik on Go back button. Step38. 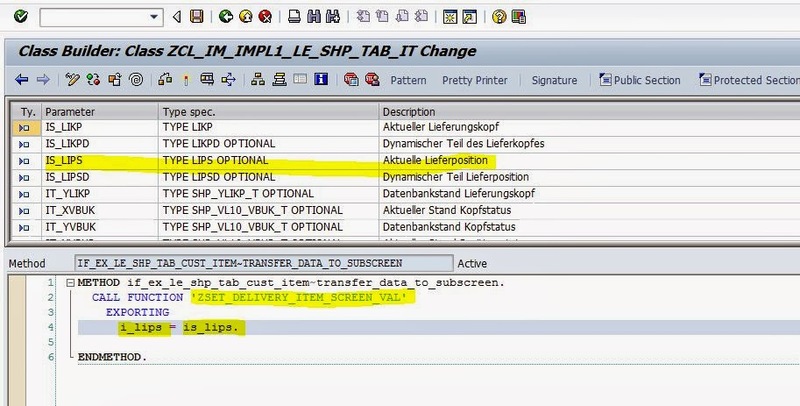 Implement the third method ‘TRANSFER_DATA_FROM_SUBSCREEN’ by double clicking on it. Step39. Provide the below code: call the appropriate function module cretaed above for the same purpose. Step40. Clcik on Go back button. Step41. At last Activate the BAdI implementation. Step42. To test it, Go to transaction : VL01N. Step43. 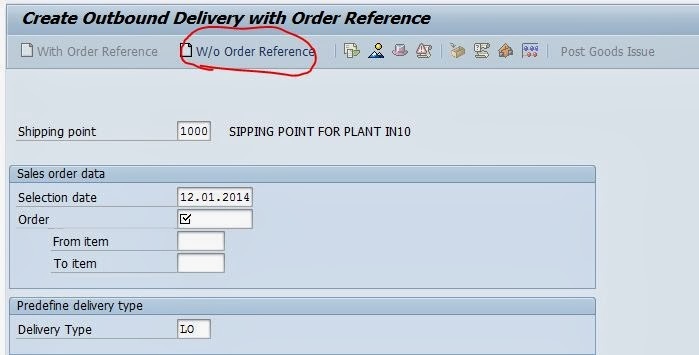 Click on the button ‘W/O ORDER REFERENCE’ . Step44. Provid the details and clcik on the Tick button. Step45. Provide the ship-to-pary, Planned Gi date , The material and quantity. Double clcik on the line item. Step46. Click on teh newly cretaed tab ‘Extra Mat Det’. Step47. The scrtren is called and displayed and Save it. Step48. Teh document ‘80000004’ is cretaed. Now navigate along the highlighted path . Step49. Hit Enter button from keyboard. Step50. Double click on the line item. Step51. Navigate to our Tab to see the details. Step52. Go to Transaction SE11. Step53. Provid eteh table as ‘LIPS’ and clcik on the display contents icon. Step54. Provide the delivery order number and clcik on F8 button. Step55. 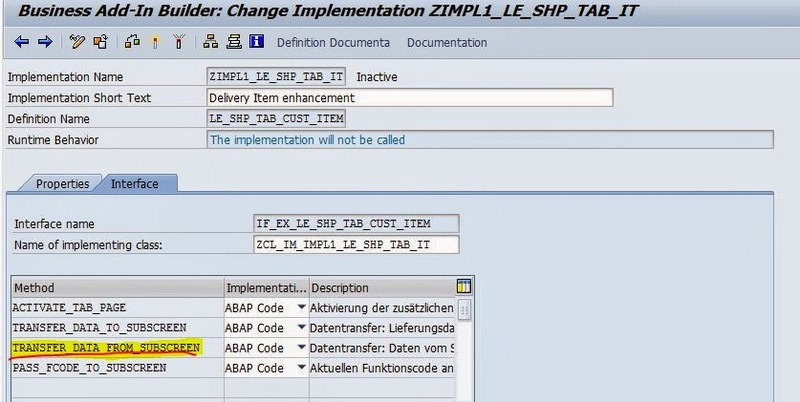 The table automatically captures the addtional line item details.